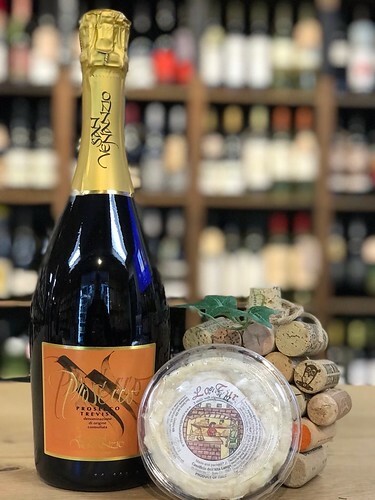 Celebrate Valentine’s Day with Sparkling Wine and Cheese! 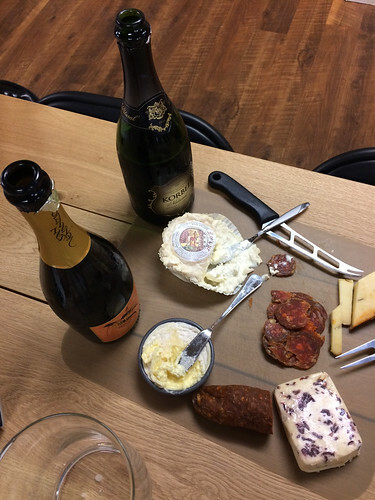 Can you believe we’ve only had a handful of Wine and Cheese Friday sparkling wine entries? We really like this type of wine so we figured we could take this chance to learn some more, and who can resist the bubbly? Sparkling wine is always festive, but what better reason to drink some bubbles than Valentine’s Day. It’s only a few days away, you know. Learn more alongside us and then give a new bottle of bubbles a try on Feb. 14. Of course, we’ve got some cheeses in here too for you to pick up. Have you ever looked into sparkling wine regarding the grapes or where they come from? There are many great options from all over the world, and even different colors of wine to choose from. Today we’ve got a red, two whites, and a rosé option with varying levels of dryness. Raise the bar this Valentine’s day with some decadent cheeses! 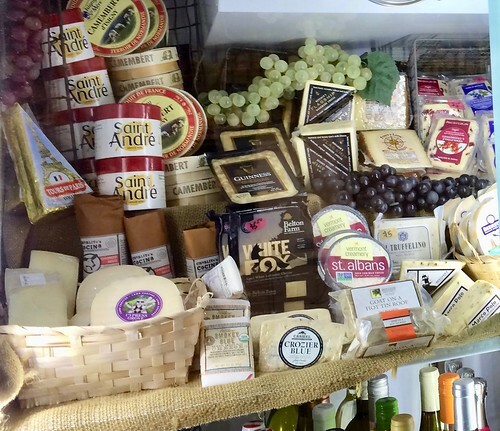 As you know from reading our website, we love cheese! We’ve matched up quite a variety of them below, each with different textures, origins, and flavors, to go with our sparklings. 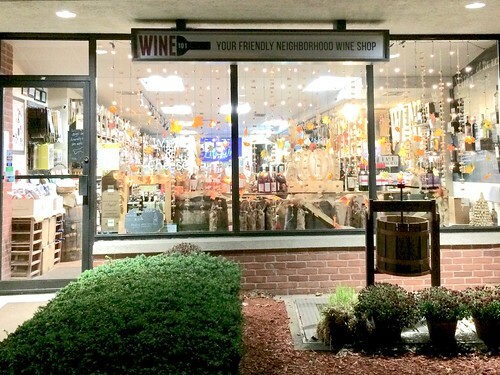 The tasting occurred at Wine 101 in Hamden, CT in preparation for a #WiningHourChat with Chris, the proprietor, and Maria & Neil from WineAndCheeseFriday, all as the featured guests. Chris put together a great selection of 4 wines, all under $20. Ready for your “Easy on the Wallet” intro to bubbly? How can you resist the “pop” of a tasty sparkler? Let’s get started. 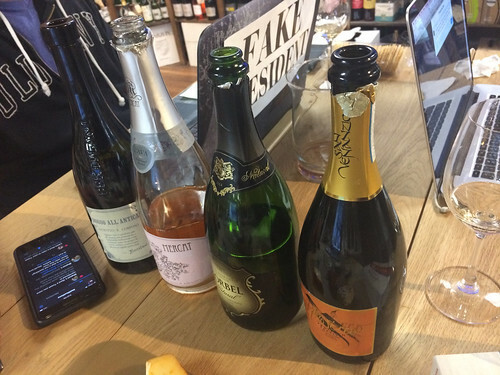 When you’ve tasted Prosecco, did you know it had different grapes than other sparkling white wines? Prosecco is actually a wine that has specific DOC requirements, including the sourced grapes and the region of Italy. I picked up mineral aromas and crisp, clean flavors with a touch of honey on this wine. When choosing a cheese, I’m always partial to a cheese that includes cow, sheep and goats milk, so Chris did great picking out the La Tur! As soon as he opened the package, I could smell the funk coming off it and some enticing milky aromas. For flavor, it definitely had a good funk and coated my tongue. Give this messy cheese a try, it was my favorite of the evening! And if there wasn’t enough funk already, the wine made the cheese even more funky. Have you heard of Methode Champenoise? It’s how sparkling wine producers describe the process of making bubbly wines. The transformation from a still wine to a sparkling actually occurs entirely inside the bottle. Want to learn more about the wine making process? Then check out Wine Folly’s article, https://winefolly.com/review/how-sparkling-wine-is-made/. Besides being the method used in Champagne, sparkling wine producers like to include the grapes used in the Champagne region as well. So although this wine is from California, it uses the grapes and method similar to what’s used in France. I thought it was a bit musty at first but then the aromas turned clean and citrus. When we came back to it again, the aroma changed to apple. There was a flavor of honey, yeast and a nice texture of bubbles. 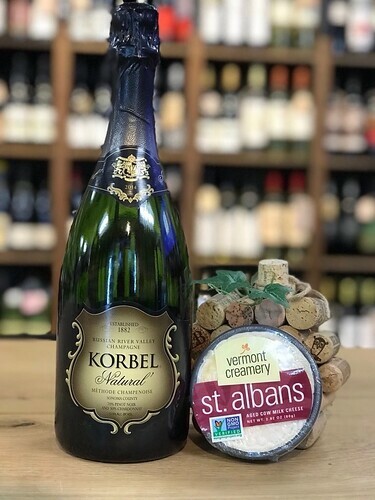 Neil and I have tried cheeses from Vermont Creamery before, but this was our first time with St Albans. It had a strange combination of funky and clean aromas. The flavor was also clean but there was some brine from the wash of the cheese during aging. Similar to the first pairing the wine jacked up the funk on the cheese. I’ve heard of Cava in the past, but all I really knew about it was that it was another kind of sparkling wine. This type of wine uses specific grapes from an area in Northern Spain. I found the Cava to smell musty and strawberry but it was the driest wine of the evening. Since it was so dry, I couldn’t notice much flavor. Neil, on the other hand, described it as “surprisingly delicate” with cranberry and pomegranate flavors. It actually fascinated him so he sat off to the side pondering it some more. This cheese is one we probably have a couple times per year, and we love the texture, creaminess and the flavor of the cranberries. This one didn’t disappoint with the texture, Neil thought it was super creamy. I picked up cheddar type aromas with some sweetness. The flavor was tangy and the cranberries were fresh, not dried! When we tasted the cheese with the wine, the wine seemed mineral and clean but didn’t change much. We tasted the Charlito’s Cocina Chorizo seco, dry cured pork, alongside this wine. It was so smoky, but you could taste the pork too. The wine cleansed the palate which helped when tasting it together with the chorizo, but it also brought out the graphite in the wine. Let’s not forget the cheese in this pairing! This one was so out of the ordinary. It smelled and tasted like pizza, with a spicy tang, even reminding me of a meatball grinder. Just like with the chorizo, the lambrusco helped to cleanse my palate. I’d guess with two pretty intense foods like chorizo and spicy cheese, it’s great to have a palate cleanser that will help you enjoy all of it. This was my favorite pairing of the evening! Are you wondering how the pairings might be mixed and matched by putting different wines and cheeses together? We were too, so we tried a few bonus pairings. 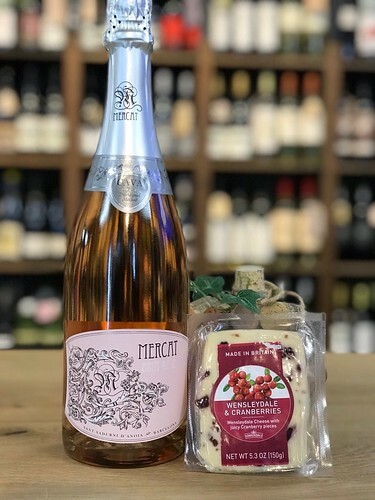 First we tasted the Mercat Brut Rosé Cava with the Hatch Chile Cheese. The cheese seemed the same to me, but the bubbles were a little more obvious in the wine. Neil found the wine to change too with more fruit. Next up was the Korbel Natural and La Tur, which caused the wine to decrease the funk of the cheese. I’d say this may have been a better match for the La Tur because the Prosecco increased the funk. Finally we paired the Rosso All’ Antica Lambrusco and La Tur. This was another nice pairing because the wine and cheese went together pleasantly. What a fun night of pairing so many bubbles and cheeses with Chris! 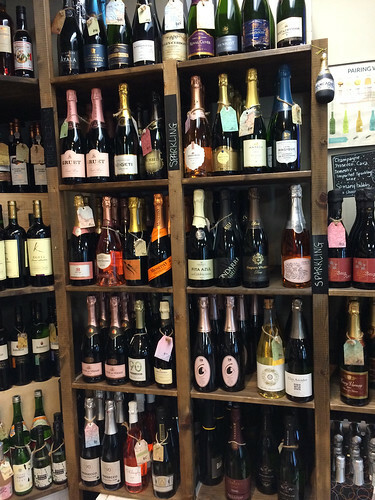 We knew we liked sparkling wines before, but now we know a little more about them. And what a great variety of cheeses to match up against them. This just might have to become an annual event at Wine 101 Hamden. 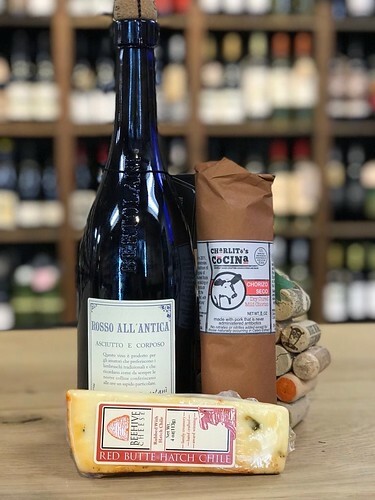 They actually do already offer wine classes and cheese classes in the store, so check out their website for more details.